The Grand River Bass Derby organizers take great pride in the success of it's Catch & Release program. Since the first Derby in 1986 over 98% of the fish caught have been released alive! In order to maintain this success the Derby is designed to minimize the number of fish brought in to the measuring station. Remember; Fish entered in the derby must be in healthy condition to be eligible! After catching a fish and removing the hook return the fish to water as quickly as possible. A fish can survive out of water about the same amount of time as you can hold your breath. After that it starts to sustain damage to it's breathing and nervous system. 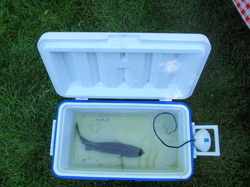 A large tub or cooler filled with river water and an aerator is ideal (see photo). The best way to care for your fish is to be prepared! Consider where you plan to fish and the time it will take you to bring your fish to the measuring station and be prepared. A large tub or cooler that holds at least 20 litres of water. A portable (battery operated) aerator. Bucket or heavy bag to fill your livewell and refresh water. Do not use tap water! Use river water only! After you catch a fish and remove the hook, measure your fish with a ruler or tape. Try to keep the fish in the water if possible. It's a good idea to mark the inside of your livewell or place a measuring stick in the bottom. If you think your fish is a contender bring it to the Derby measuring station as soon as possible. Be sure your aerator is operating and your livewell is filled with as much fresh river water as possible. The less a fish is handled the better it's chance of survival. Avoid touching the fish because it removes the slime coating that protects it. Bass can be handled easily by the lower lip, be careful not to bend the fish. While your fish is out of the water, hold your breath. When you need to take a breath your fish probably does too! Return the fish to water ASAP. If a fish is hooked too deeply it is sometimes better to cut the line and leave the hook rather than risk further damage to the fish and their sensitive gills. Condition of the fish and eligibility will be determined by Derby Officials only. Any fish deemed by officials not likely to survive will not be accepted.